Almost every single day, we receive countless stories about good fathers getting “screwed over” in the court room. As previously expressed here at LeonKoziol.com, we believe that litigant abuses taking place in family court involving divorce, custody and child support matters are leading to far more violence than what is actually being reported by the news media today. So, why isn’t anything being done about this? For starters, anyone who attempts to expose such information would more than likely run the definite risk of retaliation (see report). Who would possibly retaliate and why (see report) ? The answer may come as quite a surprise. 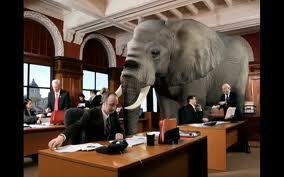 By acknowledging and admitting the detailed existence of such abuses (see the elephant in the room picture above) not only would it be an indictment of the entire legal profession and judiciary but, even more so, it would prove to be a public relations nightmare and embarrassment of the worst kind for our nation’s family courts. Especially, when their personal self-serving financial interests are routinely satisfied at the expense of predominately male litigant victims in what has now become a multi-billion dollar child control industry. It’s often these same fathers who find themselves unexpectedly placed on the defensive in the majority of court proceedings, whereby custody determination is routinely awarded to the mother as evidenced by the indisputable recent U.S. Census Bureau statistics (Table 2, page 6). Sadly, there seems to be a growing trend amongst these victims, including those with established law enforcement careers, like Jonathan Agee and others, who feel “locked out” of this very same system, which they had at one time pledged to honor and uphold. As a result, they see no alternative but, to take the law into their own hands. However, thanks to the courageous efforts of Leon Koziol, J.D, who sacrificed a lucrative law practice, as well as countless others who have worked diligently to expose these injustices, the truth is getting out and spreading like a wild fire. While we do not condone violence in any such manner, Leon Koziol, J.D.’s, recent report to the Judicial Conduct Commission was intended to serve as a wake up call and continues to reinforce that both corrective action and reform must take place in order to prevent similar future tragedies from occurring. Ironically, this same report contains and eerily similar paragraph that reads much like the Roanoke Times story and involved a member of our own local law enforcement community, who after support court was reportedly reduced to living on $26 per week. At LeonKoziol.com, we are proud to salute those in law enforcement who risk their lives to protect and serve us. It’s our sincere hope that meaningful reform can be achieved and future tragedies can be averted. We ask that you kindly consider making a contribution to the Parenting Rights Institute (using PayPal link on side of page) in order to help offset the cost of our ongoing efforts. Fighting war against terrorists in Iraq, Iran, and Afghanistan is a diversion to keep the citizens of the United States distracted about the terrorist psychopaths in the American Legal System. I have discovered that there is no access to the United States legal system for the middle class and poor of the United States. I came to these courts asking for justice and I left further …injured. When I asked the legislature and the administrative system that is set up to oversee the legal system, I was sent a curt response that no laws or ethics had been violated. These administrative personnel have condoned the use of terror in our court system. The administrative personnel and/ or pathology personalities have colluded with the crooks of the system and have become supporters of terror (tools of the psychopath). Our courts have become tools for the wealthy to oppress the poor. There are administrative laws on the books of each state. Although these laws are not available to the public, you must have access to the legal search engines to find these laws. You will need to go to a law library and use the legal search engines to find the laws of your state. This is another aspect of terrorism, keep the rules secret, and run by a secret organization that is not monitored by public citizens. The terror system that I faced was family court. This court claims to assist families in the state break the state contract of marriage. They actually post the motto: “Helping the families of Florida”. While in reality, they are torturing and committing Florida families to a life of torture and grave danger; financially, physically and emotionally. I am unable to afford an attorney and the system wants me to go away and accept the crimes they have committed. This court system has caused complex Post Traumatic Stress Disorder, an injury that many terrorist organizations skillfully employ to damage and keep the victim lifeless and quiet. The same occurs all over the nation. Our system of justice plays favorites; you are a favorite until the money runs out or if you have more money than the other spouse. Divorce to a personality disorder is war and there are disordered attorneys who also have no conscience. I hope that one day we will all be able to heal and join together to stop the legal torture of vulnerable citizens. Without a dispassionate and objective justice system based directly on the Constitution there can be no justice. Individuals must know they can have justice despite income or condition. Without these conditions being met no free market is possible. We provide tools for the accomplishment of this, the true justice, enacted by the people.